Investors want similar settlement to Hong Kong's. Andrew Loh. Eleven months after US investment bank, Lehman Brothers, collapsed, some investors of failed structured financial products in Singapore are still hoping for the authorities to help them recoup their losses. Their latest attempt at doing so is to petition the Singapore Prime Minister, Mr Lee Hsien Loong. Some 10,000 local investors were affected when Lehman Brothers went bankrupt in 2008. Some of these investors have settled their claims with the financial institutions here. They were the lucky ones. Many others are still seeking a fair settlement. 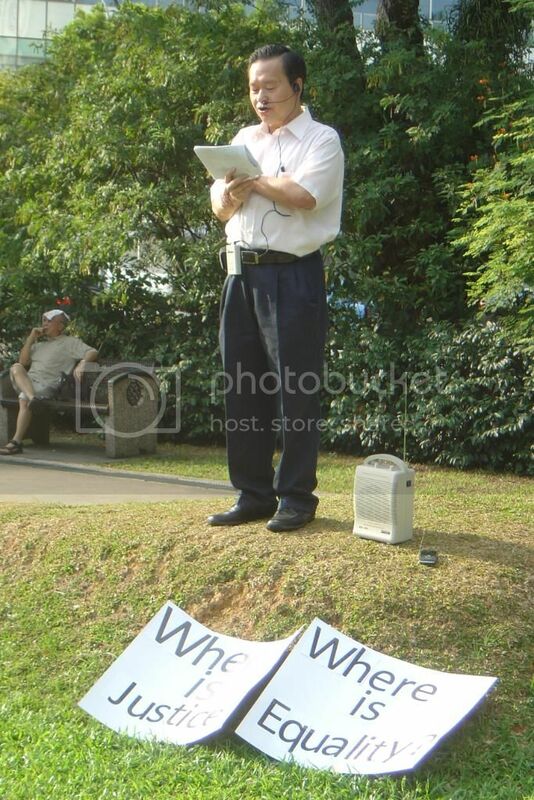 About 350 of these investors gathered at Speakers’ Corner on Saturday to sign the petition to the Prime Minister. They hope that he will intervene to help them settle the year-long dispute with the financial institutions (FI) here. They had previously signed petitions to the Monetary Authority of Singapore (MAS) complaining of misrepresentation when they were sold the credit-linked notes. These notes include the Minibonds by Lehman Brothers, DBS Bank’s High Notes, Pinnacle Notes created by Morgan Stanley, and Jubilee Notes by Merill Lynch. Led by the former Chief Executive of NTUC Income, Mr Tan Kin Lian, the investors were upset that the Singapore authorities were not as effective as the regulators in Hong Kong. “Justice in Hong Kong. 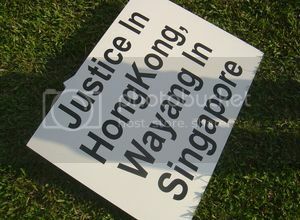 Wayang in Singapore”, one of the placards read. “Protect Singaporeans, not banks”, said another. In Hong Kong, 16 banks there which sold the toxic products to thousands of investors have agreed to return more than US$800 million to affected investors. 29,000 eligible minibond investors will receive 60 per cent of their original investment and investors over 65 years of age will be repaid 70% of the principal amount. “The Hong Kong settlement is fair,” said Mr Tan, who hopes to obtain 1,000 signatures for the petition to the PM. “It’s a matter of people realizing what is fair.” He reiterated his earlier stand that the responsibilities, however, should be shared between the institutions and the investors in Singapore’s case. Referring to Hong Kong, he said, “The Securities and Futures Commission took the lead in the settlement. They recognized their responsibilities, not only towards the financial institutions but also towards the investors.” He hopes that the Singapore authorities would do the same. Some of these investors have lost their life savings as a result of the investments. “If offered, we will accept this compensation and will be willing to bear our share of the loss,” the petition says.